Coincidently... the very same weekend...in the West Australian Saturday newspaper .... there was this article on one French Pastry chef living in Perth ~Emmanuelle Mollois... gave out his version of choux pastry (recipe below)... literally.. 'pulled' myself together (including my courage... before it decided to chicken out on me again!! 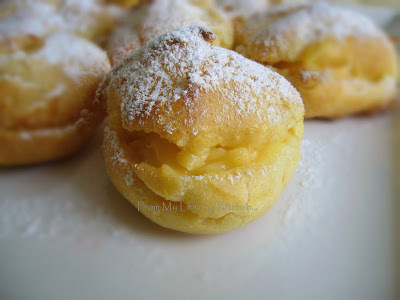 )...and the result was ~tremendously puffed... and I was chuffed!!! In a saucepan, mix milk, butter, salt and sugar. Bring to boil..... Remove from heat and mix in the flour. With a wooden spatula, mix well. Return the saucepan to the stove, and keep stirring the mix until it formed into a ball. Either use a tablespoon and drop into a dollop on a baking tray or use a piping nozzle (1 inch). Bake at 200C for 10 minutes, then lower to 180C for another 15 minutes or golden brown. 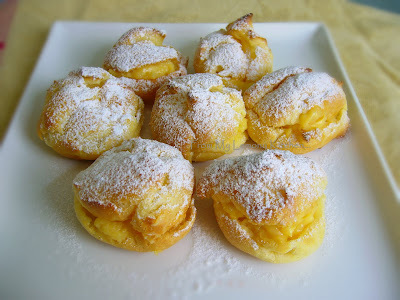 Cool the hollow choux pastry ... split into 2 and fill the pastry with either cream or custard!!. I like to fill them with ice cream...:-) Yours with custard look very delicious too!